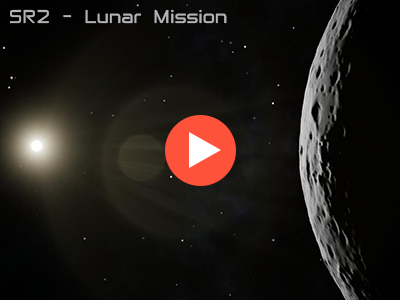 SimpleRockets 2 now has a coming soon page on Steam along with a new teaser trailer to entice you to come check it out! We're still shooting to release on Steam Early Access this summer, but we have been known to be late in the past. We plan to keep adding features and responding to player feedback until we feel the game is ready, at which point we will release the final version on all platforms at the same time. This includes iOS, Google Play, Humble, GOG, and of course Steam (Windows and macOS). 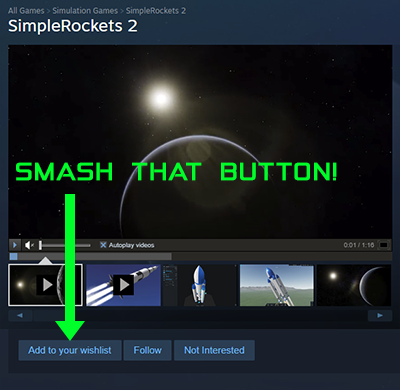 Please consider adding SimpleRockets 2 to your wishlist on Steam. It really helps us to know that people care about what we are working on. It's also a great way to make sure you are notified immediately when the game is released. You can find the Add to Wishlist button just below the video. Here's a screenshot to make it super easy to find. You will need to be logged in to see the button. @AndrewGarrison will this be a pre-order on the Apple App Store? Will you be releasing the source code for SR1 when SR2 comes out? @iLikeipads No plans for a console version currently, but of course that can change. It's interesting to me that a game like this is far easier to design for and play on a mobile device than on a console. Controls are so limiting on console. @Skywalket Yes, we still plan to have an autonomous spaceport drone ship. It probably will not be movable, except through XML editing. @Chancey21, @Oski Destruction is all rigid body. We're not doing any soft body stuff. @Thecowempire Yes, there will be a lens flare effect. WOW! This game must be awesome. I'll be waiting for release date. Added to wish list. Can't wait to play it!